We’ve certainly entered a new age of mobility. The iPhone turns a decade old in just a few months. RIM’s first BlackBerry that was actually a phone (rather than just a two-way pager) was released close to 15 years ago. And the IBM Simon, considered by many to be the first smartphone, was released over twenty-two years ago. It was certainly the first thing I saw that was anything like a smartphone. I didn’t even own a cell phone in 1994, so the device was practically mystical to my eyes. My first thought was… “who on Earth would ever need something like that?” Which was also pretty much my reaction the first time I saw an iPad or heard about connected-home appliances. Every step felt like a fad. It was the stuff of science fiction, but we’d seen that sort of technology come into being, suffer from lack of interest and prohibitive expense, and then fade away. Take video phones, for example. Every 80s sci-fi flick, from RoboCop to Back to the Future (Part II, of course) featured videophones. After many fits and starts, I was convinced that they were too impractical to ever be a real thing. And now I FaceTime with family on a near-daily basis. And so it goes. As the evolution of mobile networks, devices and, in fact, lifestyles continue to unfurl. How will CSPs and end-users adjust? What’s next for wireless? In this issue of Pipeline, we explore the latest in mobile technology. We discuss 5G, examine topics related to security, dive into analytics, and take a look at how the latest trends in mobile are erasing the distinction between life and technology. 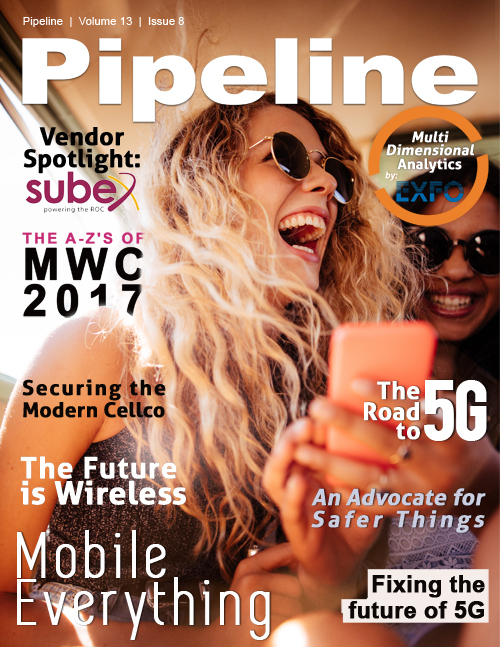 We cast our Vendor Spotlight on Subex, and we also bring you an A-Z guide for one of the largest tradeshows on Earth, Mobile World Congress 2017. All that, plus much more news and opinion that affects the ICE technology space.